Today I held a presentation about rules at the drupalcamp in Cologne, Germany. It was really amazing to see how many people are interested into rules! You can find the slides of my presentation attached to my post. If you are interested, my presentation was also recorded. Hopefully the video is up soon - probably it'll be linked here. Thanks go to criz for taking the photo! The drupalcamp here in Cologne is a pure success! There are really interesting sessions and it's just amazing how many great people are here! I'm looking forward to the next day tomorrow. Oh Greetings from cologne! Last Thursday I had to give a talk as part of a course at the university. I presented the reactive rules language XChange. Content Profile 1.0 BETA 3 is out! added support for an edit tab at the users page: either on the top level or as secondary tab below the "Edit" tab. added rules integration with support of upgrading from nodeprofile workflow-ng rules. When you have a "profile-as-nodes" you probably want to use some profile information stored in your profile content in some of your themes, e.g. to show some additional information about the author of a forum post. To do so, you previously had to manually load the profile node in your theme and output the right data at the right place - yeah and not forget to properly check your data... This cried for improvements, so I tackled this problem. We need to be able to easily access the data of the created profiles, where it should be already properly prepared for use in a template so you haven't to check it yourself. Yes and we should do that fast.. So just loading all profile data and putting it into $user is really no option. Read more about Content Profile 1.0 BETA 3 is out! Content Access 1.0 for drupal 6 released! I've just released 6.x-1.0 of the content access module - yet another node access module. In comparison to the 5.x version there are quite some changes and improvements. First off the module leverages the new permissions for content types of drupal 6: "edit any type", and "delete any type". Then consequently it makes also use of the "edit own type" and "delete own type" permissions and provides a "view own type" setting. So the 5.x "author" checkbox has been removed in favour of these role based settings. So with content access you have got the modules' settings and drupal's access permission settings. To give you a better overview about your settings content access respects and makes use of drupal's built in permissions as far as possible. Which means the access control settings provided take the built in settings of drupal into account and provide you a good overview about the really applied access control settings for a content type or content node - on just one screen! Let's show an example. If you don't grant "access content" to your anonymous users, they won't be able to do so - regardless what you would configure in content access. 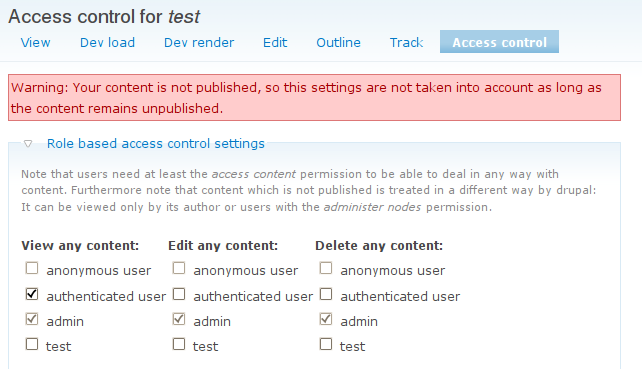 So the module forces the corresponding tick to be unchecked and shows you this message: Another example: If you set access control permissions for a certain content node, which is unpublished, drupal won't take your settings into account as it treats unpublished nodes in a special way. So content access warns you: Then if you use the "per content node" settings, it's now possible to reset the permissions of a content node back to the content type defaults. Apart from that there were a bunch of bug fixes for both drupal 5 and 6 versions. klausi tackled writing simpletests for content access and did an awesome job - now there is bunch of tests for both the drupal 5 and 6 version. This is really important thing to have, as access control is important to work right, right? Right! Read more about Content Access 1.0 for drupal 6 released! For the second exercise of my Information Retrieval course at the university I had to do implement a relevance feedback system - so I thought: Why not build it upon drupal's search? So that's what I did. The result is a working proof of concept module, which you can find in my sandbox and test at the demo site. The system has two operation modes: One that uses "implicit feedback" and one that let's the user give "explicit feedback". The implicit feedback mode just tracks which search results the user has viewed, takes these results as relevant to generate an optimised search query and shows the improved results to the user. The explicit system works the same way, but provides some UI for users to mark results as relevant and non-relevant, as you can see on the screenshot: You can test the system at the demo site, which runs in explicit feedback mode. Once you have provided three positive results as feedback the system makes use of the Rocchio algorithm to generate an optimised search query and redirects you to the improved search results. If you want to know more details about the improvements done for rules 6.x check out the development status page or the slides from the drupalcon session. Read more about Drupalcon and the Rules BETA1! How to embed a node form with drupal 6. Developers often want to embed a node form. So I'll try to work out, how this is done best in drupal 6. For 5.x I provided the subform element module, which was an easy way to do it. However recently I found out, that embedding fully working node forms in 6.x isn't so easy any more. The funky JS stuff of node forms, which relies on the #ahah form API property, fails if $form doesn't look that way it expects. So how to embed a node form with working AHAH? Fortunately, it's not that hard either. We must just ensure to keep the structure of $form as in the original form. So don't move the embedded form in $form['fieldgroup'] - or it's #ahah stuff gonna break. So let's show how to embed a node creation form. Read more about How to embed a node form with drupal 6. Content Profile - the "profiles-as-nodes" base module for drupal 6! I'm really happy to announce that Content Profile is going to be the common base module for "profiles-as-nodes" solutions in drupal 6.x! After a long discussion thought my efforts to join bio and node profile development were for nothing. But then the discussion continued and we were able to agree on a common base module, which avoids unnecessary code duplication and provides an API on which further extension modules may rely on. The people from FunnyMonkey started working on it and agreed with me on continuing my previous work on this topic: Content Profile :) So now as we have a decision we can concentrate on coding..
Read more about Content Profile - the "profiles-as-nodes" base module for drupal 6! Quite a long time ago I started the discussion about the future of the profile as nodes solutions out there (link). There was a lot of input to the discussion and most people (including me) agreed on variante 2 "build upon a small base module". This means we build a small, well tested simple profile-as-node solution, which can be further extended by other modules. So I had started developing content profile and invited others to join in - but unfortunately no one did. Now after some discussion it looks like there will be a 6.x bio version - introducing the imho unnecessary duplicity again. As an affect code like views integartion, user register integration and so on has to be written twice - once for each solution. But in my opinion the worst is that further extension modules, which want to build extended functionality on top of "profile as nodes" can't support all solutions by building upon a single module - they would have to build support for each solution on its own. Don't mentioned that they can't rely on a unique API to do so. So what I'm going to do now?